My twenty-first stadium of 2013 was on Saturday 21st September 2013 at Twerton Park in Bath, Somerset. 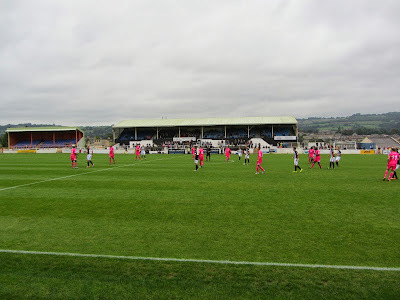 The match was Bath City vs. Dover Athletic in Conference South. Twerton Park is located in the Twerton area of Bath, around 2 miles west of the city centre. The nearest railway station is Oldfield Park which is 0.75 miles away. 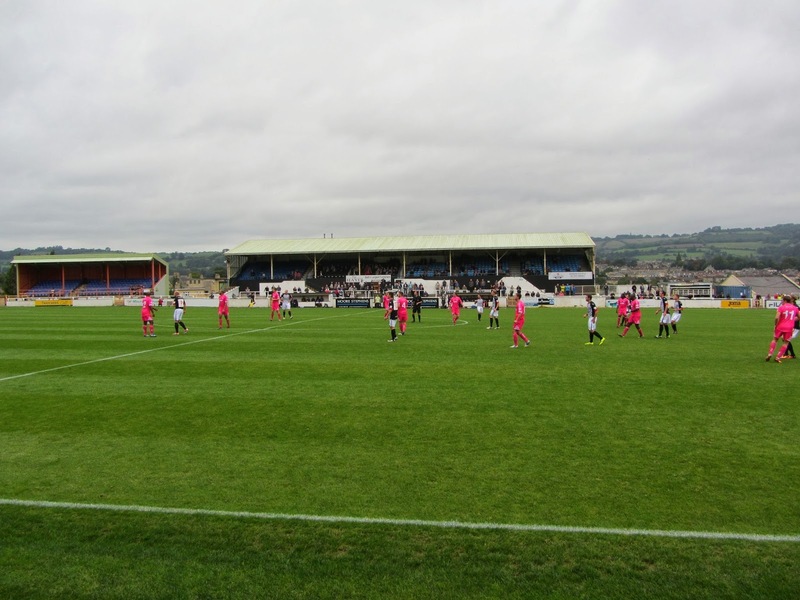 The venue is surrounded by housing and shops on all sides and has been home to Bath City since 1932. 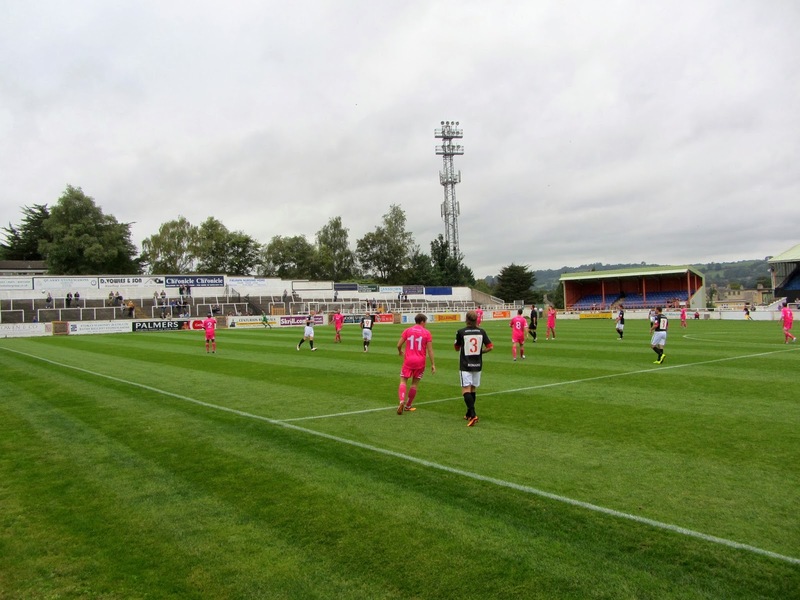 Twerton Park has also hosted league football with Bristol Rovers occupying the stadium between 1986-1996. The ground has two all-seater stands on the north side of the pitch - the Main Stand is the larger of the two stands and holds the club shop, bar and other facilities. Directly in front of the stand is a section of uncovered terracing. 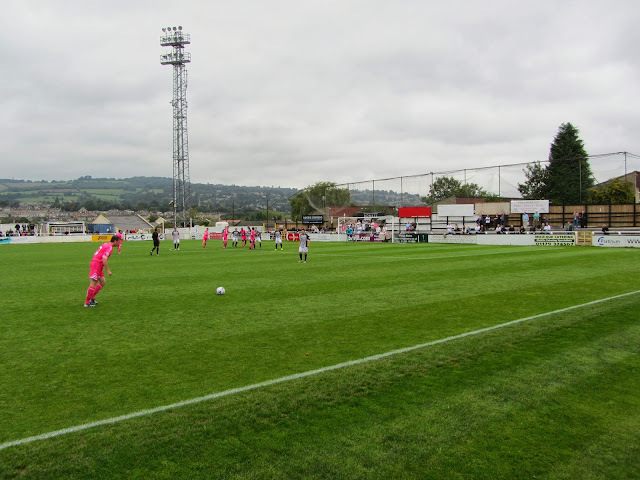 The smaller Family Stand is positioned towards the western goal and was built while Bristol Rovers were based at Twerton Park. 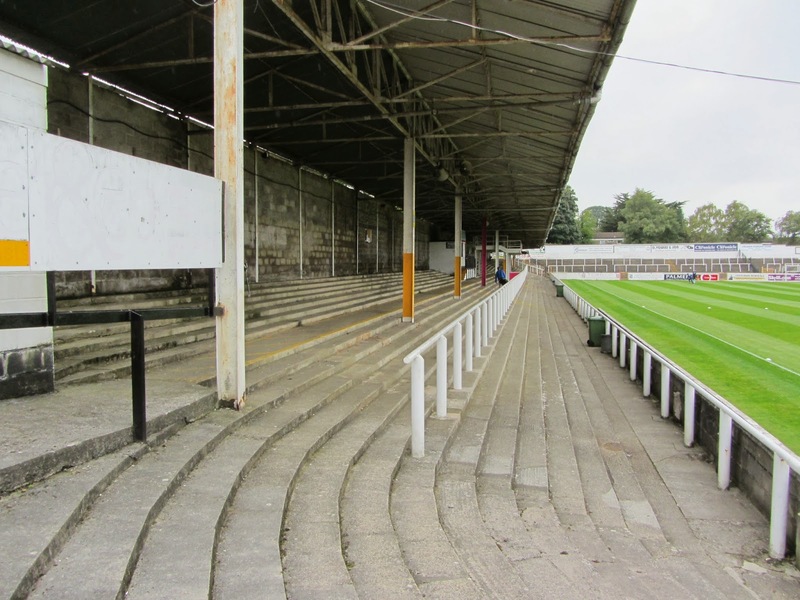 Both of these stands have supporting pillars and have a combined capacity of just over 1,000. The rest of the stadium is terracing with the Popular Side the only part of this which is covered. This stand runs along the south side of the ground and houses the bulk of the home support. There is a tea bar and gantry contained within the Popular Stand. The uncovered terracing behind the goals consists of the Bristol End at the western part of the ground and the Bath End at the eastern part of the ground. The latter is quite constricted as adjacent housing causes it to narrow towards the main entrance. The fairly substantial terracing on the south and west of the ground means the overall capacity of the venue is 8,840. Dover came into this match off the back of three straight defeats but it was the visitors who dominated the opening 30 minutes against a very poor Bath side. The home side put up almost no resistance as Dover peppered their goal with shots and only a good performance by goalkeeper Jason Mellor prevented the visitors running up a big score. Bath's passing was dreadful and whenever they got the ball they gave it straight back to Dover inviting them to have another effort at goal. Finally the pressure paid off in the 24th minute when Bath failed to deal with the second phase of attack from a corner. Tom Murphy crossed into the box and Nathan Elder produced a looping header which sunk into the bottom corner. The hosts started to get out of their own half a bit in the remainder of the first period but would have been very pleased to only go in 1-0 down at the break. Bath were much improved in the second half and their effort was almost rewarded in a scramble from a corner which was eventually cleared. The home side continued to push forward but in the 85th minute Dover went up the other end of the pitch and Ricky Modeste's cross into the area was met by the head of Tom Murphy who nodded the ball home from close range to wrap up a 2-0 win for the visiting side.